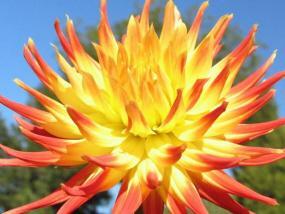 There are about 30 species in the genus Dahlia, and over 20,000 cultivars are grown today. These tuberous plants are popular for their amazing range of colors and flower shapes. Dahlias are native to the subtropical regions of Central and South America. They were important as a root crop and as a medicinal plant among the pre-Columbian Indians. Dahlia imperialis, the "tree dahlia", had hollow stems up to 20 feet long which were used for hauling water; the Aztec name was acocotli, or "water-cane". Spanish invaders cataloged several kinds of dahlias and sent plants back to the Royal Botanical Gardens in Madrid. The species was named after Swedish botanist Anders Dahl. European breeders produced double flowered dahlias by the early 18th century, and the plant was very popular between 1810 and 1840. 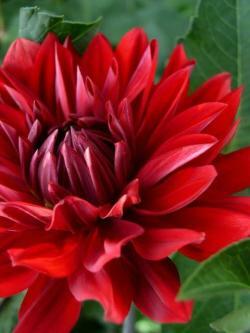 In 1872, a Dahlia juarezii tuber survived shipment from Mexico to Holland, and its brilliant red flower with pointed petals captivated breeders. Soon this new species was crossbred with cultivated varieties, leading to the thousands of cultivars being grown today. There is a dahlia for every spot in the garden! With heights ranging from twelve inches to six feet and flowers in a wide range of colors, dahlias can be useful in almost any garden location. Their late summer to autumn bloom time make them a valuable garden plant. 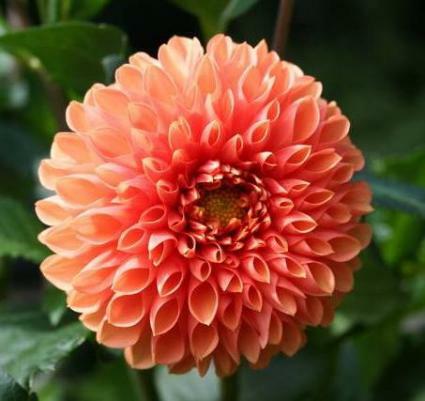 The American Dahlia Society categorizes dahlias into various groups based on the size, shape, and color of the flowers. Dahlia flowers range from less than two inches to over ten inches in diameter, and can be red, pink, lavender, purple, orange, yellow or white. The color can be solid, variegated, blended, or bicolor. Eighteen formally recognized flower shapes range from flat to spherical; some have lance-shaped petals. Foliage can be light green or so dark as to appear black. Dahlias grow best in full sun, although many varieties will tolerate light shade. They prefer a loamy soil with neutral or slightly acid pH and plenty of organic matter. They need constant moisture and good drainage. Dahlias are hardy in USDA zone 7 and warmer areas, where they can safely be left in the ground through the winter. In colder areas, the tubers must be lifted every fall. Tubers can be planted directly in the garden about two weeks before the last frost date, or they can be started earlier indoors. Wait until after the last frost to set out plants that were started indoors. Be sure the soil has warmed up before planting, since the tubers are prone to rot in wet, cold soil. Most dahlia tubers are planted six to ten inches deep. Spacing will vary depending on the size of the variety being grown. Pinching the plants when they are set out and again about three weeks later results in a fuller plant and more flowers. Deadheading also encourages more flowering. Dahlias are heavy feeders, so fertilization is helpful. Low-nitrogen fertilizers stimulate more flower production. Tall varieties may need to be staked, especially if the location is exposed to strong winds or heavy rains. Dahlias can be propagated by dividing the tubers and by taking cuttings. It is also possible to grow dahlias from seed. Dahlias are grown for every purpose from screens to pot plants. They are used in flower beds, as mass plantings, or as border plants. They also make excellent container plants. Many gardeners grow dahlias for cutting. Dahlias may have a problem with powdery mildew, especially in humid areas. They occasionally have viruses, crown gall, root rot, or wilt. Aphids and leafhoppers are the most common pests.